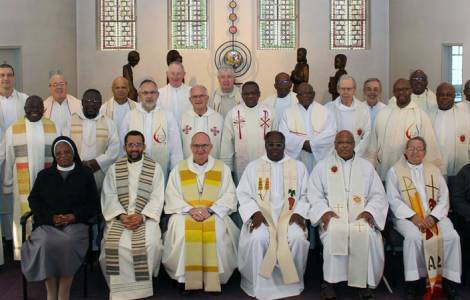 Johannesburg (Agenzia Fides) - "We hope that the next elections represent a further step in the realization of the society that God desires for us and give us as responsible leaders", is the hope of South African Bishops expressed in a pastoral letter on the general elections to be held May 8th. "The General Election of May 8th presents all South Africans with the opportunity to renew our vision for South Africa. We have the power to choose the direction our country will take", say the Bishops, who warn: "it is imperative that we choose wisely and courageously and not be distracted by false promises". "Our primary concern as your spiritual leaders is that we choose leaders who will promote the good of all by living the values of the Constitution in the light of the Gospel", the Bishops underline, who suggest voters some guidelines on who to choose among the various candidates. "Ask yourself who could eradicate corruption more effectively; provide realistic programmes to overcome unemployment and poverty; appoint selfless public servants as leaders at national and provincial level; effectively reduce the level of violence tyrannising our people; transform those attitudes and practices which underlie the violence against women and children (…). In short, who do you think would make us proud to be South Africans? Each one must answer these questions according to their conscience". Finally, the message calls for the peaceful conduct of the vote. For this reason the Bishops ask the political parties to refrain from inflammatory, intimidating and inappropriate statements; take visible, decisive action when candidates and their supporters are involved in acts of intolerance, intimidation, harassment and disturbance; respect the election results; do everything to ensure that the rule of law is respected.